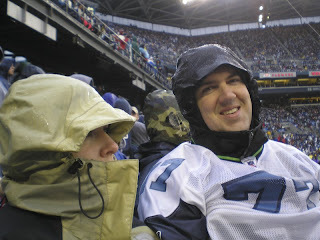 It is absolutely pouring outside right now and Carrie and I aren't going to the Seahawks game. The Hawks have nothing to play for, and quite frankly they aren't that good this year. Arguably the two best players (Matt Hasselbeck, Walter Jones) are not playing because of injuries. If any of those factors were different, I'd be there. I enjoy watching football, even when my team isn't doing well. Like I have said many times, if the Hawks win, it is a net positive in my mood, if they lose, no change. That takes care of the first two. The problem is the last one. I enjoy being in the cold and rain... ...when I am doing an activity the ups my mood. Say fishing, taking the dog for a walk, even camping. I am a Seattlite with a few years in Alaska thrown in. We have all the right gear too. It's just watching a game with those other two conditions thrown in means there is fairly high chance that nothing good will happen. I can stay dry and warm, watch the game on my HD big screen, save some cash, and gain the extra two hours back that it takes to get to and from the game. This is why they put roofs on stadiums.